Pagi tadi saya dengar radio KL. Berita. Just after Al-Ziqr oleh Ustaz Wan Shohor Bani Leman. 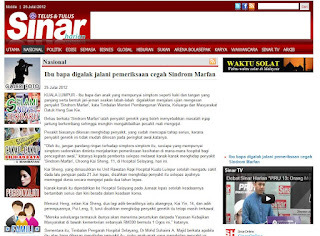 .... adalah SINDROM MARFAN... "
So saya dengar bab-bab kematian ni, memang sensitif! Tapi pelik juga la. tangan macam labah-labah...? U sure or not, that this is not some genetic disorder...? So saya pun cari la Pak Google. saya ada jumpa website, tapi ceritanya dalam bahasa indonesia pula.. so saya tak paham sangat. so saya google bahasa inggeris lah! 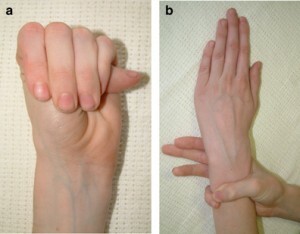 Marfan Syndrome (‘síndrome de Marfan‘ in Spanish) is a disorder of the connective tissue. It is generally hereditary in nature. As you know, the connective tissues are the fibres that provide a frame to the body. It supports the body and gives it shape. When a person suffers from this disease, the body shape becomes somewhat abnormal. It can affect various body organs like the eyes, heart, skeleton and blood vessels. There is no specific cure for this condition. In some cases, it may even be life-threatening. The disease first got its name in 1896. A French pediatrician named Antoine Marfan saw the symptoms of this disorder in a five year old girl. He was the first physiological expert to bring this health condition to light. The condition has been named after him. This particular disease has some unique symptoms. In most cases, these can be found out from a person’s physical features. 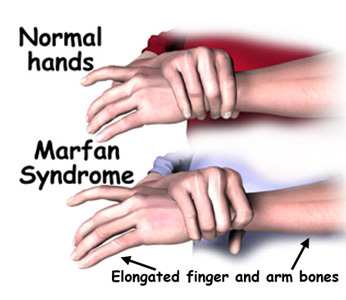 Here are some of the well known Marfan Syndrome symptoms. Generally, people suffering from this disorder are exceptionally tall. Even those who are not very tall are taller than average people. This is because the condition impacts the skeletal system of the affected persons. People suffering from this disorder also have long limbs. The arms, fingers, legs, toes and the face are long and thin. In medical terms, this disorder is called ‘Dolichostenomelia’. 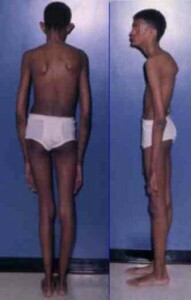 Patients of this syndrome often suffer from skeletal curvature. In many cases, the person has a curved spine. The roof of the mouth is arched. This brings the teeth closer lending a disproportionate appearance to the face. In some people, the ‘sternum’ or breastbone is bulges outward. The disorder also affects the eyes. A person with this disease can have one or both his eye lenses located wrongly. The lens may be shifted to a side or located a little higher or lower. The dislocation may be a slight one or it may be more pronounced. This may also have an effect on the sight of the sufferer. The person may be myopic or short-sighted. He or she may also have glaucoma from an early stage of life. There can also be cataract problems resulting in unclear vision. A person who has this disease may suffer from skin problems. In many cases, the patient has stretch marks on his or her body. A recent weight change can produce stretch marks in your skin. But stretch marks in Marfan Syndrome sufferers can be found even in the absence of a weight alteration. Sufferers of this disorder often have a hernia in their abdomen. It is known as ‘Inguinal hernia’. In such cases, a bulge develops inside the abdomen that contains some intestine parts. Heart problems are crucial in sufferers of this disorder. The defective connective tissue actually affects the walls of the aorta. The aorta transports blood to the heart from the other body parts. In Marfan persons, the aorta walls are weak. This often leads to ‘aortic dilation’, a condition where the walls of the aorta stretch abnormally. It may lead to the sudden tearing of the aorta or other serious heart problems causing even death. In Marfan sufferers, the tiny air sacs in their lungs become less flexible. In some cases, the sacs also swell. If not treated in time, this can cause serious life risk. Since the disease was first diagnosed, scientists and researchers have spent hours on it. They have tried hard to discover what are the real causes of Marfan Syndrome. It is now believed that heredity is the prime reason behind the appearance of this condition in a person. The child of a Marfan sufferer has a fifty percent chance of inheriting the disease. The disease may also happen because of a gene abnormality occurring during the formation of the sperms. This can lead to a child developing Marfan Syndrome even without any parent suffering from it. •Collecting records of the presence of the disease in any parent, family member or ancestor of the patient. •Physical check-up that mainly focuses on the analysis of the skeletal structure of the sufferer. •Eye tests, to detect any abnormality in the eye lens or vision of the affected person. •Heart tests that check the cardiovascular condition of the person. These examinations are carried out to detect the rhythm of heart-beat as well as the size and shape of the aorta. The echocardiogram test is a must for Marfan Syndrome sufferers. Marfan Syndrome is generally not life-threatening. Even in the case of serious abnormalities, timely check-up and proper medication can keep the affected person in good health and lead a normal life. Famous persons like Austin Carlile, Sir John Tavener and Flo Hyman are known to have this condition. But you can see that the disorder has not stood in their way of reaching to the top. Marfan Syndrome is not the end of life. You can lead a happy life even with this disorder. Sindrom Marfan (juga disebut sindrom Marfan) adalah gangguan genetik dari jaringan ikat. Kadang-kadang diwariskan sebagai sifat dominan. Hal ini dilakukan oleh sebuah gen yang disebut FBN1, yang mengkode protein ikat yang disebut fibrillin-1. Orang-orang memiliki sepasang gen FBN1. Karena dominan, orang-orang yang telah mewarisi satu gen mempengaruhi FBN1 dari orang tua baik akan memiliki Marfan. Sindrom ini dapat dijalankan dari ringan sampai berat. Orang dengan itu Marfan biasanya tinggi, dengan tungkai panjang dan jari-jari yang panjang dan tipis. Komplikasi yang paling serius adalah cacat katup jantung dan aorta. Hal ini juga dapat mempengaruhi paru-paru, mata, kantung dural yang mengelilingi sumsum tulang belakang, kerangka dan palatum durum. Selain menjadi protein ikat yang membentuk dukungan struktural untuk jaringan di luar sel, protein fibrillin-1 yang normal mengikat protein lain, mengubah pertumbuhan beta faktor (TGF-β). TGF-β memiliki efek merusak pada pengembangan otot polos vaskuler dan integritas dari matriks ekstraseluler. Para peneliti sekarang percaya bahwa sekunder untuk fibrillin bermutasi ada TGF-β yang berlebihan di paru-paru, katup jantung, dan aorta, dan ini melemahkan jaringan dan menyebabkan fitur dari sindrom Marfan. Sejak angiotensin II receptor blockers (ARB) juga mengurangi TGF-β, mereka telah menguji ini dengan memberikan ARB (losartan, dll) untuk sampel kecil dari muda, pasien sindrom Marfan sangat terpengaruh. Pada beberapa pasien, pertumbuhan aorta memang berkurang. Hal ini dinamai Antoine Marfan, dokter anak Perancis yang pertama kali mendeskripsikan kondisi tersebut pada 1896 setelah melihat fitur mencolok dalam seorang gadis 5 tahun. Gen terkait dengan penyakit ini pertama kali diidentifikasi oleh Francesco Ramirez di Mount Sinai Medical Center di New York City pada 1991. Sindrom Marfan mempengaruhi pria dan wanita sama-sama, dan mutasi menunjukkan tidak ada bias geografis. Estimasi menunjukkan bahwa sekitar 60.000 (1 di 5.000, atau 0,02% dari populasi) Amerika memiliki sindrom Marfan. Setiap orang tua dengan kondisi memiliki risiko 50% dari melewati cacat genetik pada setiap anak karena sifat autosomal dominan. Kebanyakan individu dengan sindrom Marfan memiliki satu anggota keluarga terkena, tetapi kira-kira 15-30% dari semua kasus disebabkan oleh''de novo''mutasi genetik Hal ini terkait dengan ekspresivitas variabel; penetrasi lengkap belum definitif didokumentasikan. Nak tengok rupa kalau ada sindrom ini...?